Since launching the Weekly Wine Blog, a few people have asked me why the wines listed are all at least $15. The underlying question is whether more expensive wines are actually better, which is a question that has come up during tastings as well (and is a very valid one!). 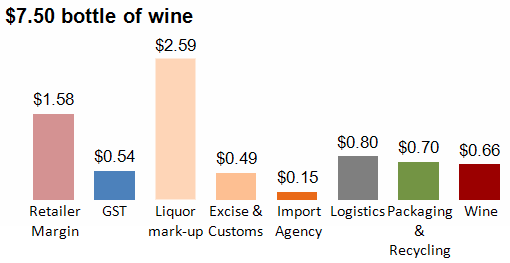 A recent Bibendum Blog Post addresses this question very well for the UK market, so the illustration below uses their approach to show how spending a few extra dollars increases a wine’s value exponentially in Alberta as well, though the graphics may not be as slick. The numbers are based on pricing information from the Alberta Gaming and Liquor Commission, as well as a few assumptions, listed below. 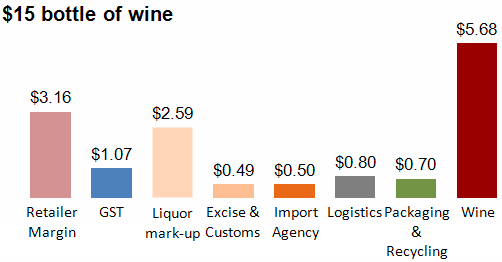 Clearly, what’s driving this are the relatively high fixed-costs (among which taxes make up the majority) for lower end bottles. Here’s to good value of at least $15 a bottle! The Retailer Margin is assumed to be 28%. Although some retailers’ margins will be less (e.g., Costco), 28% is a fairly conservative margin in Alberta’s wine market. The Importer Margin is assumed to be 7%. The GST includes the GST charged at wholesale and at the retailer. 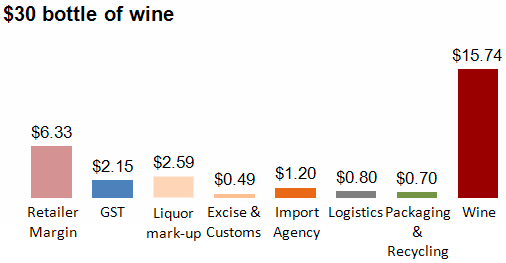 Excise and custom rates are based on an imported bottle at between 7.1% and 13.7% abv. Packaging and logistics costs are assumed to be fixed. Logistics costs are based on the Bibendum article, but also account for increased shipping, warehousing, and transportation costs in Alberta compared to the UK. Since these assumptions do not apply to all wines, these numbers should be used as a guideline only.